These Farm Heroes level 434 cheats and tips will help you beat level 434 of Farm Heroes. The objective of Farm Heroes level 434 is to reach 100% growth in 25 moves by collecting 2 sheep, 12 flowers, 140 strawberries, and 140 suns. 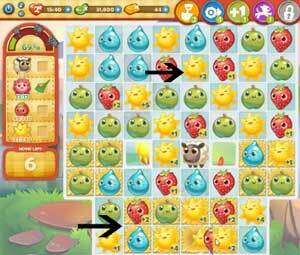 Your first objective in Farm Heroes Saga level 434 is to make all of the flowers bloom. You have to collect all of the 12 flowers on the board to reach your quota and they are blocking up the board. The flowers are blocking the sheep from getting to the hay squares and getting collected, so it is a must to take care of most of the flowers first. You don’t have to clear all the flowers before you try and get the sheep to the hay squares, but you need to take out a majority of them for you to have the space to maneuver the sheep safely to their extraction points. You will want to make horizontal matches adjacent to the flowers so you can hit more than one flower at a time, thus maximizing your move. 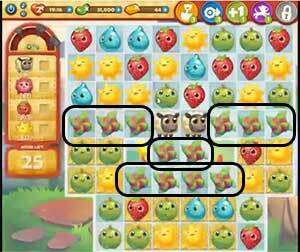 Try to make larger horizontal matches with either yellow suns or red strawberries to score more points, collect more of the quota, and make the flowers bloom all at the same time! The sheep move when you make matches adjacent to them. You can actually maneuver the sheep depending on how you make the matches next to them. A sheep will jump to the cropsies square which was moved to make the match adjacent to it. 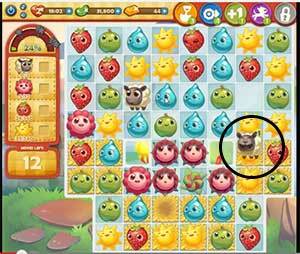 For example, if there is a sheep directly on top of two red strawberries and there is a third red strawberry one space away directly to the right, and you move that red strawberry one square to the left to make a match, the sheep will jump to the square where that final strawberry on the right was to complete the match. So, you can maneuver the sheep to get to the hay and be collected. Once the you clear the flowers and have given yourself space, you can move the sheep to the hay squares and collect them. Try to do this with yellow suns and red strawberries as well, so you are killing two birds with one stone again! With 280 regular cropsies to collect in addition to the flowers and sheep, you have your work cut out for you. Look out for big matches, even if they aren’t of required cropsies. The bonuses they distribute will help you collect tons of cropsies. This is a pretty large level, so finding a match of five in a row will be easier. These are incredibly powerful!